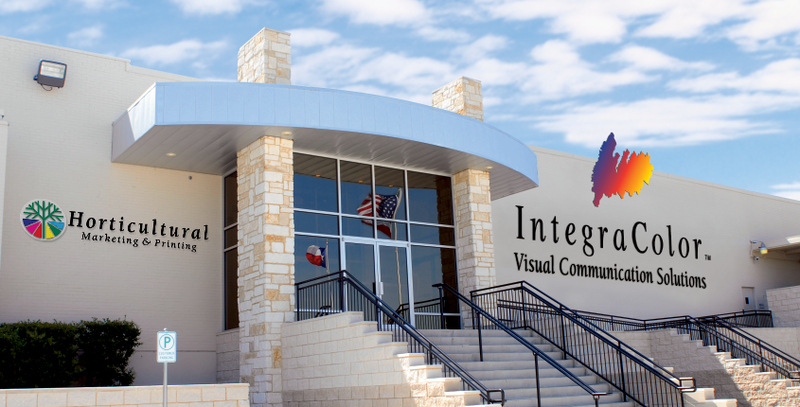 A privately held company with headquarters in Mesquite, Texas, we have over five acres of production area and 400 employees who are dedicated in serving over 4,000 businesses throughout North America. In 1997, Horticultural Printers formed IntegraColor, to sell printing to markets outside horticulture industry. The formation of IntegraColor allowed us to diversify and keep our presses operating full-time, year-round, thereby keeping costs low for all our customers. While our roots and major emphasis continues to be in the horticultural industry, IntegraColor serves a wide range of clients, including Fortune 500 companies like ChevronTexaco, Coca-Cola, JCPenney, Chevron-Texaco, and Church's Chicken with a wide range of point of sale products. Working with these companies has greatly enhanced our knowledge and expertise in merchandising and marketing. This is what makes Horticultural Marketing & Printing unlike any other printer that serves the horticultural industry. 1) Help growers determine how their products fit in the marketplace, gain the consumers confidence, increase the value consumers perceive their plants, differentiate, and generate better profit margins. We assist in planning, developing, and producing effective and uniquely-targeted custom marketing programs that invigorate their businesses. 2) Help nursery retailers better merchandise products and promote their brand using a wide range of marketing tools, including point of sale signs, sign holders, tags, and web sites. Some use the off the shelf products found in our catalog, while others ask us to help develop a totally customized approach.